Russian capital Moscow will host the 10th International Mstislav Rostropovich Festival from March 27 to April 3. The festival's opening ceremony will take place in the Great Hall of Moscow Conservatoire, Trend Life reported. Concerts as part of the festival will be also held in Zaryadye Concert Hall and Tchaikovsky Concert Hall. 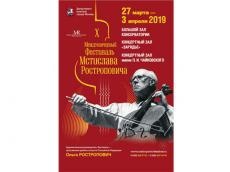 The International Mstislav Rostropovich Festival was established by the Foundation of Cultural and Humanitarian programs named after him in memory of the legendary cellist, conductor, whose creative and social activities had no boundaries. He inspired and premiered over 100 pieces and formed long-standing artistic partnerships with such prominent composers asDmitri Shostakovich, Sergei Prokofiev, Henri Dutilleux, Witold Lutos?awski, Olivier Messiaen, Luciano Berio, Krzysztof Penderecki, Alfred Schnittke, Norbert Moret, Andreas Makris and Benjamin Britten.